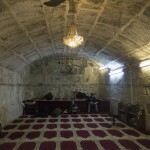 It is located under Al-Qibli Mosque. It is a passage of two arcades towards the south which were build during the Ummayad period. These arcades used to lead to the double door and then to the Ummayad Palaces. 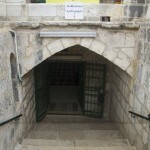 This mosque used to be a part of Al-Aqsa Mosque. 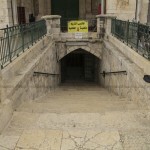 It is located under the middle arcade of Al-Qibli Mosque and it is accessed down through a stone stairs in front of Al-Qibli Mosque. The mosque consists of two big arcades from north to south with big stone pillars that hold the roof on which a part of Al-Qibli Mosque lies. It represents a part of the southern settlement established on the original slanted ground of Al-Aqsa Mosque so asto construct on a flat surface. 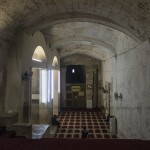 However, the main reason behind building it was to make it a passage for the Umayyad princes coming from the double door, from which there is a view of the Umayyad palaces located in the south of Al-Aqsa Mosque, and going directly to Al-Qibli Mosque. 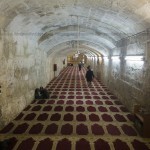 This place remained abandoned and filled with stones and dust until it was reopened for prayers in 1419 Hijri\ 1998 AD, by Al-Aqsa Foundation for the Construction of Holy Sites and the Jerusalemite Islamic Heiratage Committee, when the number of worshipers coming to Al-Aqsa increased. It has an area of about one and a half acres. However, the section allocated for praying is small and can only accommodate about 500 worhipers. In 10/08/1990, the occupation authority closed ventilation slot and treated the dampness in the walls of the Al-Aqsa old mosque.